Originally designed in 1989, these luminaria began Robin’s business as a wholesale designer and artist. Robin is celebrating her 29th year anniversary in business by offering these lovely timeless pottery pieces that add charm to any home or garden. All luminarias and candle cups are handmade from terra cotta earthen ware. Kiln fired, they come painted or unpainted. They are built from slab clay and pinch pot method Then the headdress/ ears/ collars/ mask/ capes are fastened on. After all that, a design is drawn on the cylinder part and cut out. They are then burnished to a beautiful glow and fired to 2000 degrees. 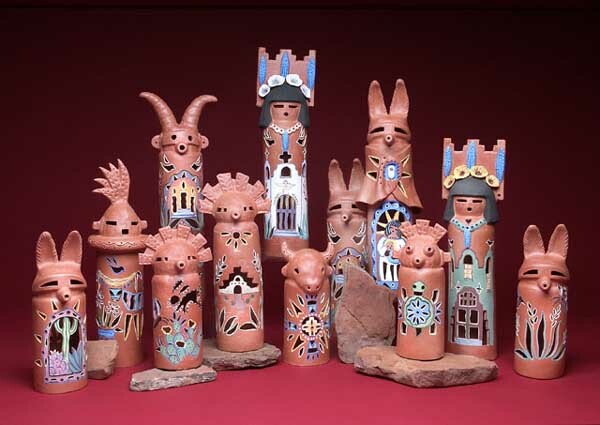 Each one is a whimsical character that reflects life in the desert and southwest culture. They are totally functional and meant for a candle or a battery operated candle. They are indoor or out door decor, and can be electrified. Each piece is signed by Robin. Come back often because she has more designs being introduced later this month. The deer’s antlers are transformed into branches for crows and flying things. The antlers are made of Terracotta clay and fastened on a wood dowel. Made to order. Contact me for pricing and ship details. Baby Buffalo Luminary unpainted with folk art images of deer and antelope greeting. Both have a bird cut out on their back sides. Measure 14″ x 8″ , Available painted. Made to order, contact me for pricing and ship details. Jack Rabbit Luminary, with long ears and all. 16″ x 8″ The painted image is of the southwest desert and a jack rabbit looking over his shoulder. Available unpainted. Made to order, contact me for price and ship details. Foxy Luminary. You wouldn’t think Foxes dwell in the desert but they do. In the higher altitudes you can spot the little critter with big ears and gold eyes. This one has a window cut out with a Saguaro/ desert image. Available unpainted. In Stock, contact me for price and ship. details. Small Raven Luminary, The raven is known for using his brain, collecting strange things and giving warnings with it distinct call. This one has a window cut out with a colorful painted desert mountain scene. Group: From Left to Right- Small Mudhead, Large Raven, Tall Eagle Feather, Tall Caped Coyote, Small Jackaloup. Luminary group lit up for the holidays.